Have you ever used keyboard shortcuts and sequences in PowerPoint? Or are you a complete keyboard aficionado? Do you want to learn about some new shortcuts? Or do you want to know if your favorite keyboard shortcuts are documented? 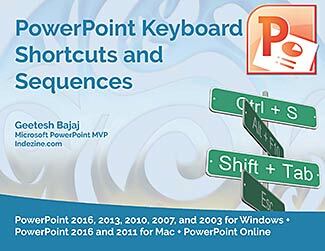 Go and get a copy of our PowerPoint Keyboard Shortcuts and Sequences ebook. © 2006-2019, Geetesh Bajaj. All rights reserved.